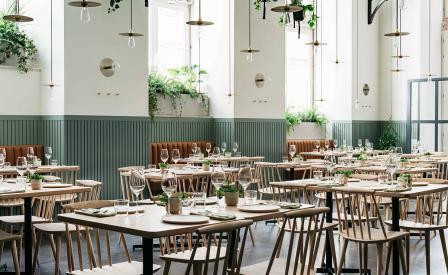 Exquisitely balanced, ingredient-led, farm to table food served with beguiling simplicity in a low-key, large and leafy restaurant has been causing a stir on one of Lisbon’s narrow, cobbled streets. The concept for the menu and the design came from the building itself, an abandoned early 19th-century factory which made candied fruit, preserves and biscuits. Left derelict for 20 years, verdant vegetation had wrapped itself around the pulley system, hanging down from the high ceilings. From this, the idea of Prado – which translates as Meadow – was born, and local outfit Ark Studio designed an urban restaurant which brims with the feel of a pastoral paradise. Endless greenery hangs from the ceilings and cascades from the high window sills over white-washed walls which are trimmed with sage-green wooden shutters and wood panelling- also echoed in the napkins and uniforms. The seasonal food delivered by the young and very talented António Galapito celebrates Portugal’s bounty and dances off the plate from the very first taste of fresh goat’s butter with smoked salt and sea lettuce. Expect dishes like Minhota beef tartare, wrapped in grilled kale; or smoked Bluefin tuna belly, kumquat and bergamot mint; and don’t miss the sensational mushroom ice cream, pearl barley, dulse and caramel.